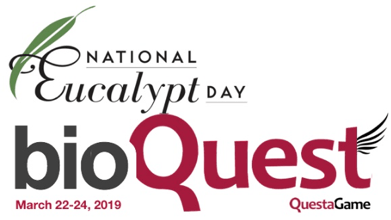 Below is a list of the events and celebrations occurring as part of National Eucalypt Day 2019. 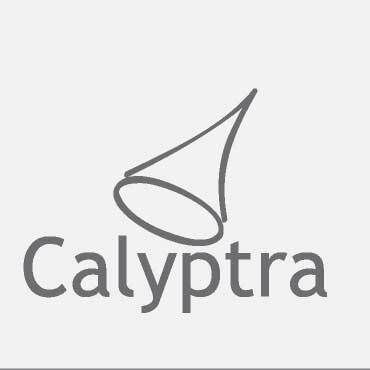 We thank our partners for their support! You can find out more on Twitter (@EucalyptAus and#EucBeaut19) and on the Eucalypt Australia Facebook page. 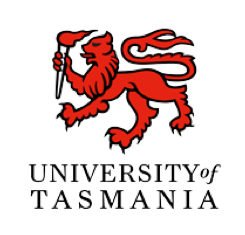 More than 100 researchers from around the world will gather at the University of Tasmania from 18–21 February to share their research. Eucalyptus regnans, the tallest flowering plant in the world will be sequenced during the conference. Find out more. 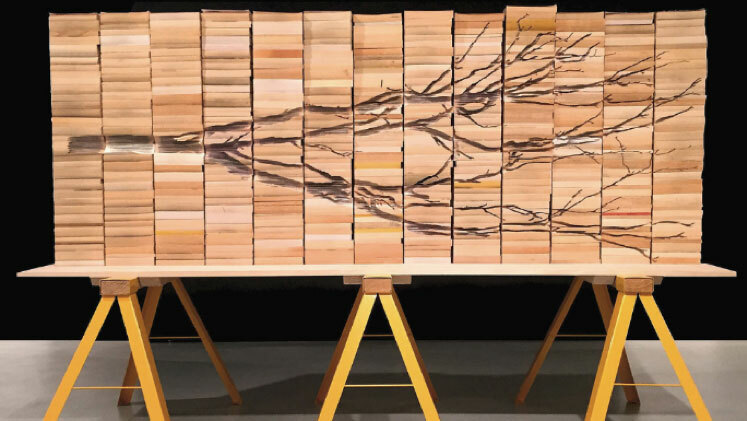 Kylie Stillman will present an outdoor sculpture that reflects on and celebrates the majesty of this most iconic of Australian trees. The sculpture will sit on the entrance forecourt of the Castlemaine Art Museum during the Festival as a testament to the creative inspiration of our natural environment. 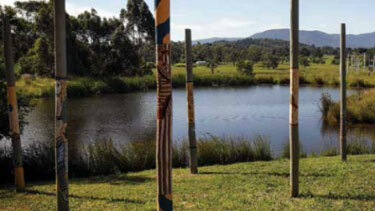 The sculpture was commissioned by Eucalypt Australia in conjunction with the Castlemaine State Festival. Learn more. Put on your walking shoes, grab a hat and head for the Open Days at Currency Creek Arboretum on Saturday 23 and Sunday 24 March. The Arboretum boasts the world’s largest collection of eucalypt species with over 800 species and 8000 individual trees covering 30 hectares. 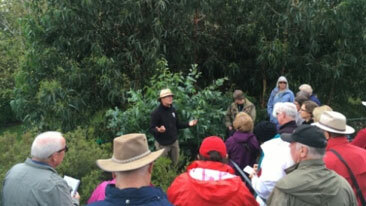 At 10.00 am and 2.00 pm each day, Arboretum Curator and Eucalypt expert Dean Nicolle will lead free tours. 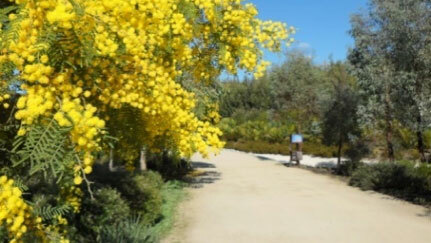 Join passionate horticulturalist Russell Larke on a guided walk at the Cranbourne Botanic Gardens. 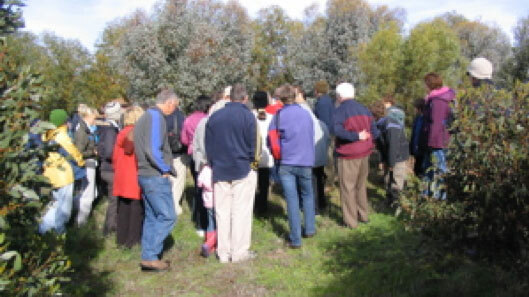 The tour begins with a traditional water ceremony followed by an introduction to the diversity of flowers, foliage, bark and forms of the Mallee Eucalypts. Learn about the unique characteristics that make these trees great additions to any garden, and get tips on how to care for them as they grow. You’ll get to take home your very own Eucalypt seedling. 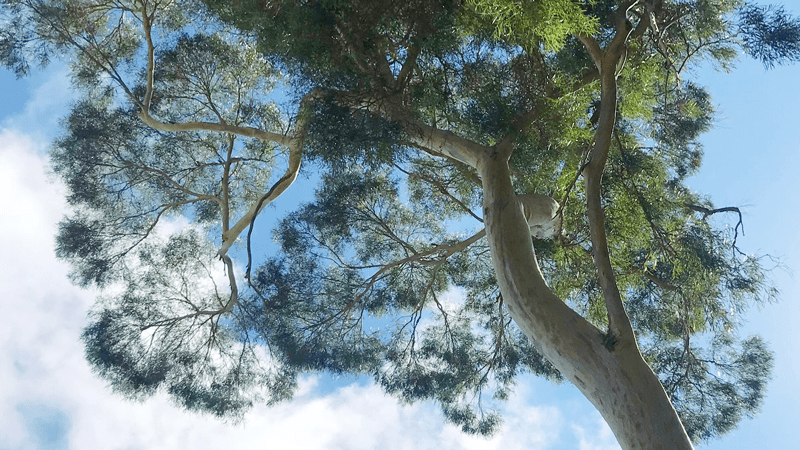 Join a 1.5 hour guided walk to hear the stories behind the most iconic tree species at the Melbourne Gardens – the eucalypts. The walk leaves the Visitor Centre at 11.00 am on Saturday 23 March. Bookings essential. Contact the Royal Botanic Gardens. 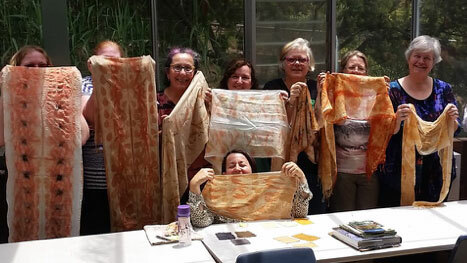 Dye a scarf to take home using eucalypt leaf and bark dyes at a workshop with Sally Blake on 23 March. Take a self-guided walk along the recently updated Eucalypt Trail or join a guided walk throughout the week 18–24 March. More information. Primary school students visiting Healesville Sanctuary on 22 March will be treated to a special day learning about how people and animals rely on eucalypts. Indigenous elder Murrindindee will perform a special ceremony and explain the significance of eucalypts to the Wurundjeri people. With support from Eucalypt Australia and the City of Perth, four WA poets are writing and recording new poems responding to mallee species. Hear the poems performed near the Mallee Garden in Kings Park between 8.30–10.00 am on 23 and 24 February. 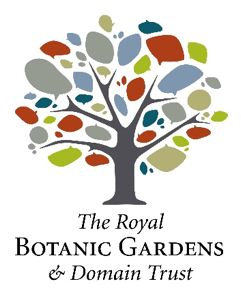 Meet at the Western Australian Botanic Garden sign at 8.30 am. 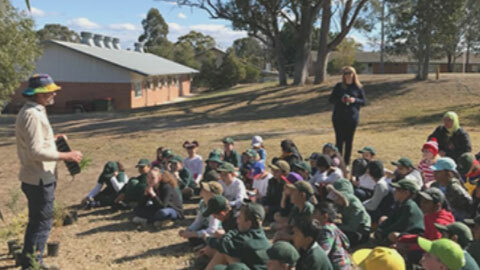 Youth Community Greening and Eucalypt Australia have joined forces to inspire young people across Sydney to learn more about the world of Eucalypts. This initiative will reach three lucky new schools in the lead up to 2019 National Eucalypt Day. The children learn about the fascinating past of the plants including the evolution and adaptations, their importance in the Australian landscape and how plants were traditionally used, particularly the uses of Eucalypts for tools, weapons and medicine. Eucalypt habitat gardens will be planted by the students. 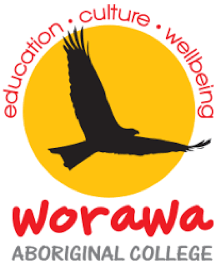 Supported by Eucalypt Australia, a Eucalypt Dye Garden has been established at Worawa Aboriginal College. 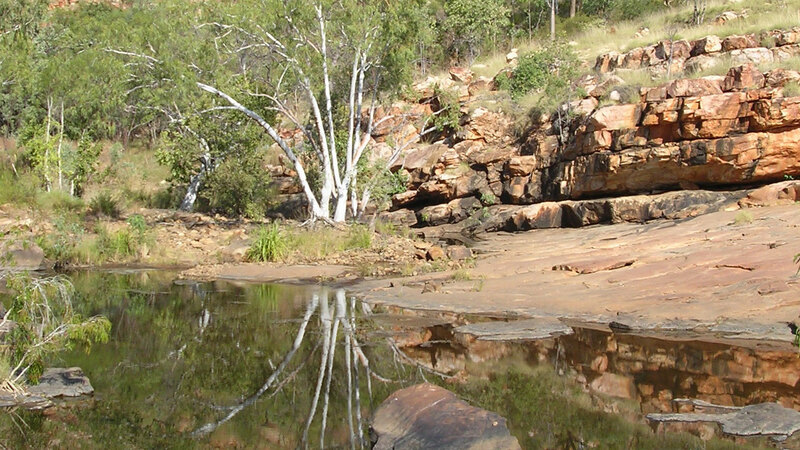 The garden will provide natural dyes for a range of traditional and contemporary Aboriginal products. Guided by elders, Aboriginal artisan Simon Penrose has created an artefact kit from eucalypts and other traditional materials that includes a message stick, spears, woomera, fighting club, digging stick, boomerang, shield and coolamon. The kit will be used for educational purposes. 10.00 am, Saturday 23 March. 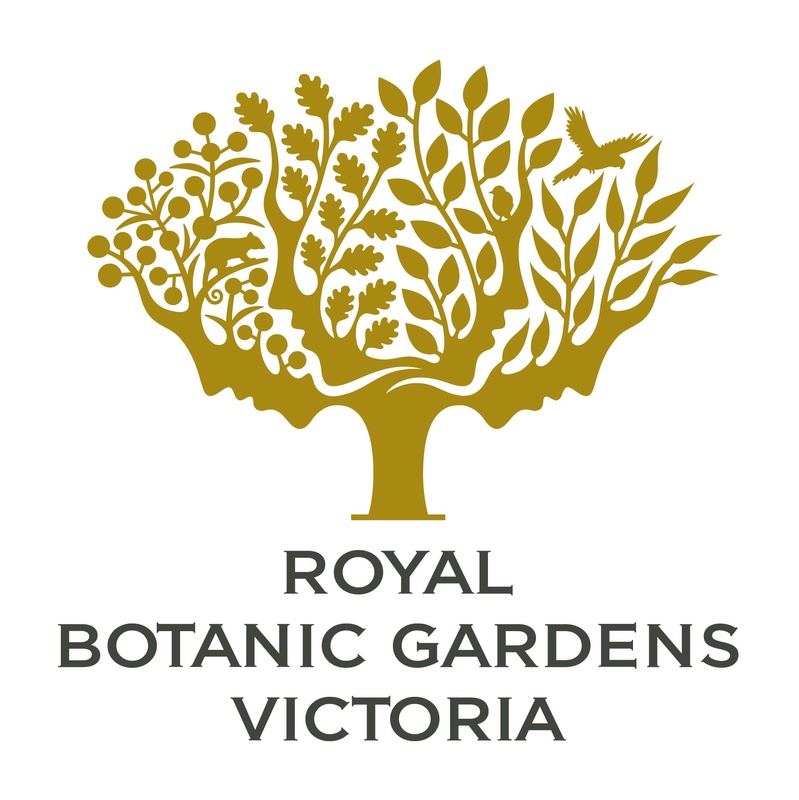 Join one of several small-group tours with one of the Garden’s experienced volunteer guides, exploring the many Tasmanian and Australian Eucalypt species in the Royal Tasmanian Botanical Garden collection. 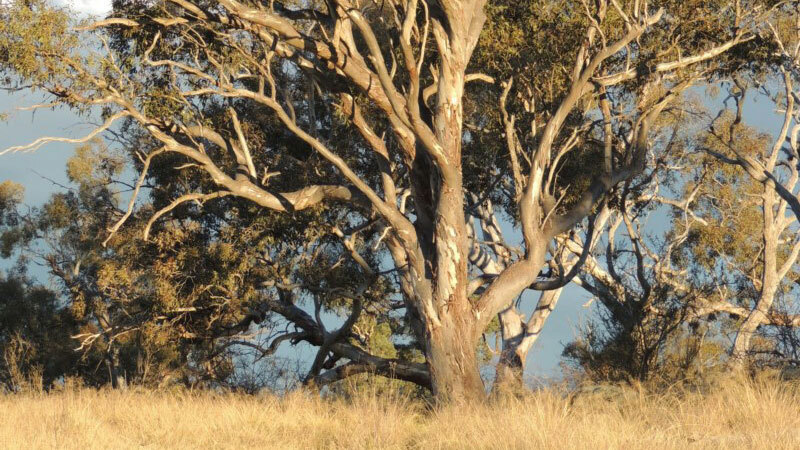 Many of the Eucalypts you will see are rare and threatened species, each with a story to tell. The tour includes a tasting of honey produced from Tasmania’s floral emblem, the Tasmanian Blue Gum, harvested from the hives kept on site. Bookings essential. Contact Esther 6166 0453 or 0436 806 553. Learn more. Calling everyone with a camera: help build our understanding of biodiversity by photographing the eucalypts you see and the birds, insects and mammals that are on them. Your photograph will be sent to experts at universities and museums across Australia for verification and you’ll be notified of the outcome. Verified specimens will be added to the Atlas of Living Australia database. BioQuest will run from 22–24 March. Learn more. If you are in the Bendigo region, be sure to visit the Eucy Museum. On offer are two free distillery demos at 11.00 am and 2.00 pm on 23 March. Phone to book: 03 5438 3127. Short of time? Then view the myriad of historical artefacts on a self-guided tour. Video: What’s causing our eucalypts to die? Prepared for National Eucalypt Day by The Tree Projects, watch this short video to find out what has caused the death of an important stand of Eucalyptus viminalis in Tasmania, and what this means for other eucalypt species. 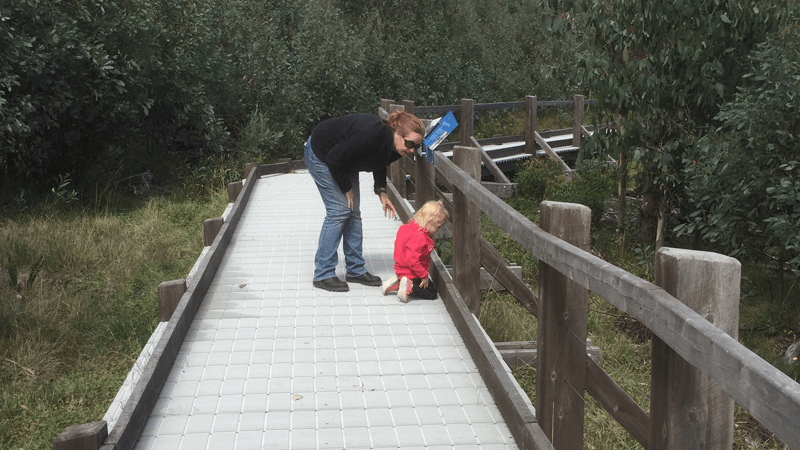 If you’re in the Lake Mountain area in Victoria in March, be sure to take a walk along the Bjarne K Dahl Boardwalk. The eucalypt regrowth since the 2009 wildfires is quite spectacular. Situated at Snowy Hill, approximately 1 km before the Lake Mountain Resort. With assistance from the Loddon Mallee Interchange, 150 Eucalyptus blakelyi will be planted at Korong Ridge Conservation Estate. 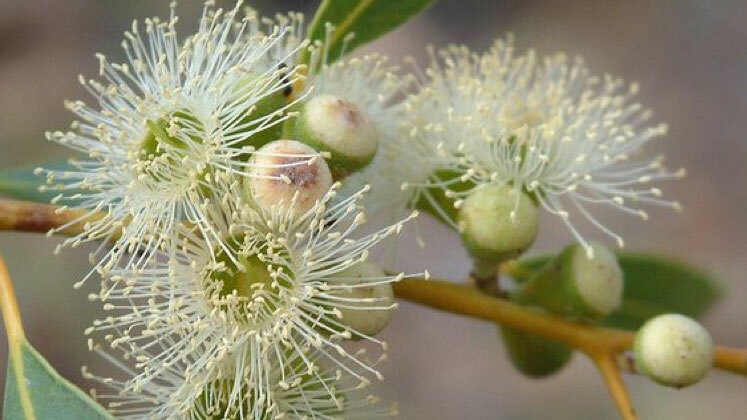 At this workshop at the Mount Korong Eco Watch (MKEW) Nursery, members of MKEW will demonstrate techniques and share tips on how to grow Blakelyi Red Gum. You will learn the principles of propagating native seeds, how to propagate by division and cuttings and the right growing media and containers to use. To register call: Trudy Nelson 0419 800 980. Do you live in the Broome area? How about joining a community tree planting? Too strenuous? Then visit the Broome Regional Library to see of display that celebrates Eucalypts. 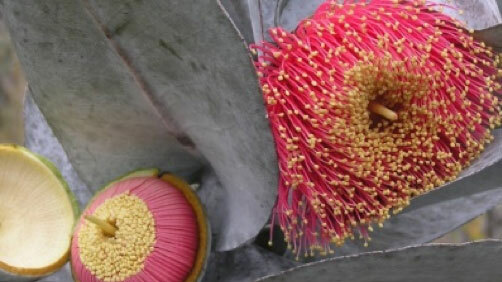 This will feature two at-risk Eucalypts: Corymbia paractia and Eucalyptus mooreana. 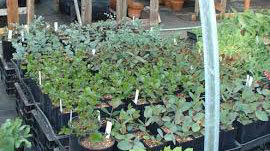 For details on the planting contact Environs Kimberley. 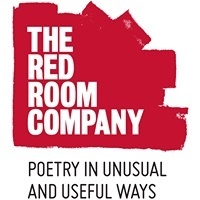 Friday 22 March 12:30 pm. 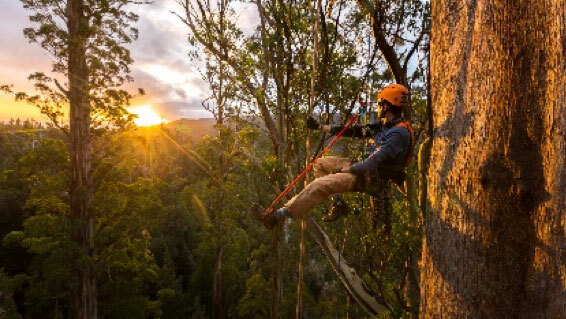 See the notable eucalypts growing in the gardens of the University of Tasmania with a tour guided by world-renowned eucalypt biologists and authors of the popular Tasmania eucalypt field guide EucaFlip, Professor Brad Potts and Dr Rob Wiltshire. 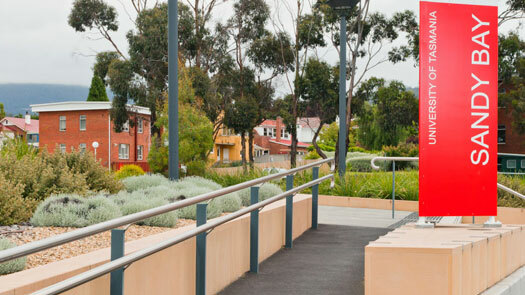 The 45-minute stroll around the Sandy Bay campus will depart at 12.30 pm from the upper end of the Churchill Avenue overpass, outside the Life Sciences building. 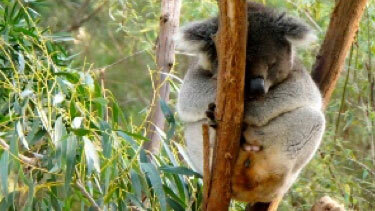 Eucalypt Australia would like to acknowledge our supporters helping to celebrate National Eucalypt Day.